The cold has arrived and the snow has covered our favorite collecting sites, but that does not mean that we cannot read about them. There are even novels written about some of the fossil-rich sites in western New York. 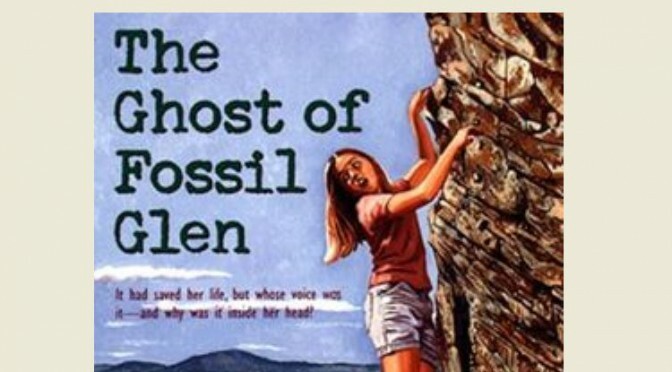 In this case, a children’s novel, set in the prized fossil location, Kashong Glen. Cynthia DeFelice, a nationally known writer of children’s books, attended William Smith College in Geneva and never left the area. She was a school librarian in our club’s home town of Newark in the 1980’s and now claims she does most of her writing from a second floor room in her home in Geneva overlooking Seneca Lake. She has authored over 30 children’s books including a series of ghost stories featuring Allie Nichols, who is a 6th grader when she encounters a ghost in Kashong Glen near her home. The Hope diamond is one of the most recognized and well known jewels in the world. At 45.52 carats (9.104 grams), the 1” by ¾” pear-shaped blue jewel is currently valued at more than 200 million dollars. From its undocumented discovery in India in the 17th century (or before), the diamond has seen owners in India, France, and Britain before coming to the United States early in the 20th century. It has been re-faceted on several occasions to improve quality and luster. The gem has resided in the Smithsonian Museum of Natural History since 1958, when Harry Winston, a jeweler from New York City, donated the famous gem with the hopes it would stimulate further donations. It did and the National Gem Gallery at the Smithsonian is a must visit for anyone trekking to Washington D.C. This month we will talk about a local mineral location, but not a collector site. It is in our backyard. Well perhaps more appropriately, it is in our cellar. The rocks and the minerals it contains do not crop out, but they are everywhere. And none of us could live without them. OK, admit it, you have not heard of the Hampton Corners Mine? But maybe you know where the largest salt mine in the United States is located? Yes, it is the Hampton Corners Mine, and it is located just south of Rochester, NY. You drive by it just outside Mt. Morris if you are headed to, or from, Rochester on 390. For a moment when you drive past you may even wonder what they do in that strange looking building just east of the highway. 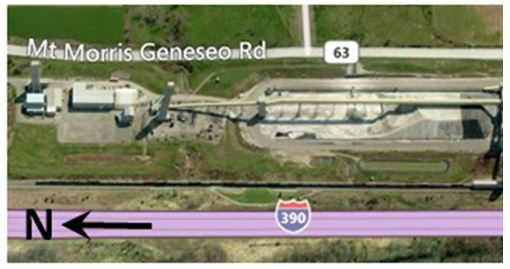 American Rock Salt Mine and surface facility looking east across Interstate 390. Note the shafts to the left and the stockpiled salt to the right. The Hampton Corners salt mine was opened by American Rock Salt in 1998 to replace the flooded Retsof Mine of Livingston County just 6 miles north. After over 100 years of continuous mining, the catastrophic 1994 flooding event in the Retsof Mine left the region with a demand for low cost road salt, but no local source. American Rock Salt stepped into that void as local businessmen purchased the property near Mt. Morris and established a new mine. In fact they established the only new salt mine in the United States in the last 40 years. Winter is coming to upstate New York so I decided to take us to the desert for this month’s column, specifically to the large, generally flat dry lake beds of Death Valley National Park in California. 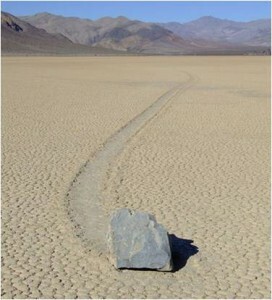 For decades scientists have observed large rocks strewn about the playa surface and speculated about how they got there. Often they are found with long, sometimes curved tracks suggesting movement across the desert surface. 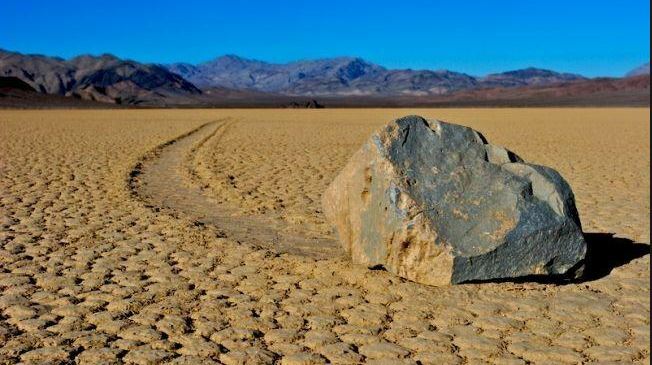 In the past, many theories were proposed to explain how rocks, some as heavy as 700 pounds, could slide or sail across the dry lake bed creating a furrow or trail in their wake. Hurricane force winds and muddy playa surfaces were suggested. Slick algal mats present during rare wet periods and thick ice accumulations were also proposed, but experiments and models developed with these ideas could not duplicate the phenomena. Furthermore, it did not seem reasonable that roving herds of pronghorn antelope had entertained themselves by pushing stones around while no one was watching. Besides there were no hoof prints! I have had an active interest in mineral collecting for several decades (five years in Arizona can do that to anyone), but have developed a growing interest in fossils since moving to western New York two years ago. Having completed my first full season of mucking up creeks and stopping at roadcuts in the Silurian and Devonian strata of western New York I can announce that I now have a favorite fossil. I realize many are, and for very good reason, enamored with trilobites. Be they DiPleura, Greenops, Dalmanites, or Eldredgeops , those are certainly great finds and I will be more than happy to pick one up when I come upon it. But I took a fancy to a simple tabulate coral species this summer: Pleurodictyum americanum, a species first described by the German paleontologist Carl Ferdinand von Roemer in the late 19th century. Note his original drawings in the featured image for this post (Roemer, 1876). Perhaps it is the near perfect symmetry of the colonial coral that grabbed my eye. With a rounded top and a fairly flat bottom they certainly look grand once clay and shale is washed from the polygonal corallites covering the surface. Even better presentation results when multiple specimens of variable size are displayed together. My interest was also sparked because “pleuros”, as I have come to affectionately call them, are not as common as horn coral or many of the brachiopods species that are ubiquitous at many sites in the Finger Lakes region, but they are also far from rare and when found they are typically complete and recoverable. You can call it the Gouverneur Talc Company No. 4 Quarry, you can call it the Valentine Mine, or you can just call it that quarry off route 3 south of Harrisville, NY. Regardless of the name, in the business of wollastonite, the small quarry/mine in extreme northern Lewis County is pretty important. 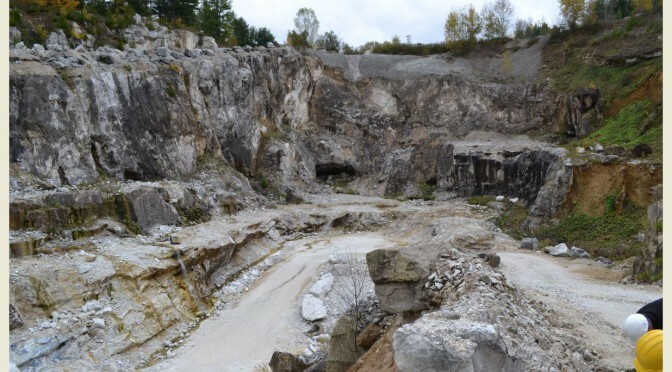 Together with the Lewis Mine of Essex County (see Feb 2014 entry on this website), the two quarries provide all of the US production (and 10% of the world’s supply) of the industrial mineral wollastonite.